After Sunday’s loss to Denver that included 11 penalties for 98 yards for the Bills, head coach Doug Marrone took responsibility for the team not playing more disciplined against Denver. When his players heard about that they said there’s just one place the blame should go and that’s on them. Bills TE Lee Smith disagreed. TE Lee Smith is sidelined with a lower right leg injury. Head coach Doug Marrone provided an update. “He had an injury in the weight room and he’ll be ready for training camp,” said Marrone. The nature of the injury was undisclosed, but judging by coach Marrone’s comment it sounds like he won’t be on the field until late July. Dorin Dickerson was carted off the field last Sunday, but things are looking up for him playing this week in the season finale against the Jets. Dickerson’s availability is critical for Sunday’s game with Scott Chandler on injured reserve and Lee Smith the only other healthy tight end on the roster. Bills TE Scott Chandler might miss his first game of the season this week. Chandler did not practice for a second straight day along with CB Aaron Williams. If Chandler can’t go the offensive staff is expected to make use of both Lee Smith and Mike Caussin to spell Chandler. 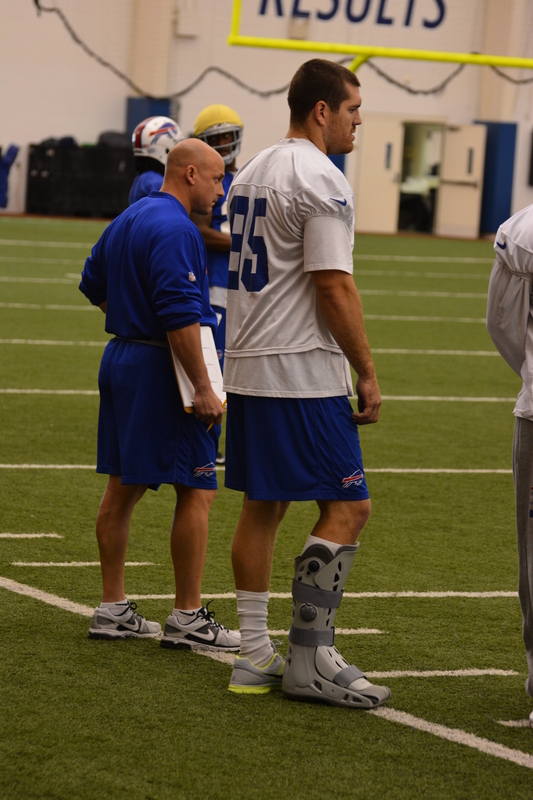 Bills head coach Chan Gailey confirmed that TE Scott Chandler will not practice with the team here today (Wednesday). Chandler, who suffered an ankle injury last Sunday, is undoubtedly eager to play this week against the team that drafted him in the Chargers back in 2007. If he can’t go rookies Lee Smith and Mike Caussin would team up to spell Chandler in the lineup. With veteran TE David Martin released to make room for CB Terrence Wheatley on the active roster, rookie TE Lee Smith will step into a bigger role on game days. Martin had been serving as the team’s primary blocking tight end, but now that he’s no longer on the roster that duty will fall to Smith. Smith (6’5″ 270) was picked up off waivers from New England at the start of the regular season. Now that he’s been around a month, he’s likely comfortable enough to execute a game plan on a Sunday. With Scott Chandler the only other tight end on the roster, it’s likely that Smith will be active on Sunday. Smith has been inactive each of the first three games. Bills newly signed TE Lee Smith, who was picked up off waivers from New England over the weekend, was acquired with a primary purpose in mind… blocking. There are two offensive players that have new jersey assignments. Newly signed tight end Lee Smith will wear No. 85 and Ruvell Martin switched to No. 82.